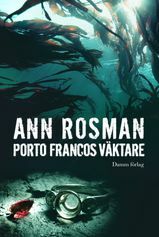 Porto Franco's guardian is the violent story of Marstrand time free port. The time is the late 1700s, hijackers, smugglers and killers ravaging undisturbed. A young woman disembark in the port of Marstrand one September day 1793rd The hair is cut in the hat, her breasts are wrapped and pants hang loosely on the threaded body. All around teems with life; sailors on the ships, traders, criminals with amnesty in Freeport. Her only hope is that they should take her for a man, she will find work and somewhere to live. That she will not be forced to go back. 220 years later made a horrible bargain on Klovero. A woman and an infant found dead in old mice and Detective Karin Adler connected. But to identify the two dead turns out to be easier said than done. The only thing one can say with certainty is that they have been in the bog long. Very long time. I have long wanted to tell you about Marstrand time free port, Porto Franco, 1775-1794. And of Porto Franco-letter ninth section, which meant that Marstrand was a haven for criminals, in all cases involving the crimes that could not life or honor offended. Bankruptcy and embezzlement are two examples of this, although counts and others who saw themselves as superior to little preferred to write "derangerad economy" as the cause of his Marstrand Escape. I wanted to capture life on the small island and all who lived here at that time. Herring Cartridges, swindlers, Jewish merchants, prostitutes, privateers, buccaneers, customs officers, pilots, Carlsten prisoners, French noblemen, merchants, sailors from various nations and in the midst of all this - the locals. But I also wanted to tell you about those who got cut letters, but went across the border and became pirates. With a cutting letter, issued by the king, in his pocket the crew had the right to take on both the merchant and war ships belonging to countries such as Sweden was in conflict with. The idea was that the hijackers would constitute a form of defense for the West Coast and simultaneously provide Sweden with the goods. The hijacked ship crew was at Carlsten Fortress, while the boat and cargo were collected and auctioned. The crown replaced every gun with a sum of money. However, it was tempting to the hijackers rather than take care of the entire load and the guns themselves. Profits were so much bigger then. But the crew would probably gossip and the safest was to get rid of them ... dealers, including Widell, collaborated with the creators - or should we call them pirates - and many of the traders had even cut their own ships. The observant may see that there is a W for Widell of the house with grönärgat copper located on Harbour Road 25, on the quay. The problem was that the time periods are not quite coincide, but ran after each other. Porto Franco-era ends in 1794 while the pirates in Marstrand waters are most aktiva1800-1825th The solution was to allow a person to tie together the two epochs: Agnes from Näverkärrs farm up on Härnäset, north of Lysekil. Härnäset and Klovero It also points out a lot about each other and I thought that Agnes probably would feel at home in Klovero. Marstrand last pirate dies 1854 - that's not very long ago. So step ashore on Marstrand quay anno 1793 - a crazy time!